Production: Warner Bros. Pictures, Inc.; black and white, 35mm; running time: 126 minutes. Released January 1948. Filmed Spring through Summer 1947 in Tampico, Mexico and in the mountains near San José de Purua, Mexico. Cost: $3,000,000. Producer: Henry Blanke; screenplay: John Huston, from the novel by B. Traven; photography: Ted McCord; editor: Owen Marks; sound recordist: Robert B. Lee; art director: John Hughes; music: Max Steiner; special effects: William McGann and H. F. Koenekamp; technical advisers: Ernesto A. Romero and Antonio Arriaga. Cast: Humphrey Bogart ( Fred C. Dobbs ); Walter Huston ( Howard ); Tim Holt ( Curtin ); Bruce Bennett ( Cody ); Alfonso Bedoya ( Gold Hat ); Barton MacLane ( McCormick ); A. Soto Rangel ( Presidente ); Manuel Donde ( El Jefe ); José Torvay ( Pablo ); Margarito Luna ( Pancho ); Jacqueline Dalya ( Flashy girl ); Robert (Bobby) Blake ( Mexican boy ); John Huston ( Man in white suit ); Jack Holt ( Flophouse bum ); Ann Sheridan ( Streetwalker ). Awards: New York Film Critics Awards for Best Picture and Best Direction, 1948; Oscars for Best Direction and Best Supporting Actor (Walter Huston), 1948; Venice Film Festival, Best Music (Steiner), 1948. Huston, John, The Treasure of the Sierra Madre , edited by James Naremore, Madison, Wisconsin, 1979. Davay, Paul, John Huston , Paris, 1957. Allais, Jean-Claude, John Huston , Paris, 1960. Michael, Paul, Humphrey Bogart: The Man and His Films , Indian-apolis, Indiana, 1965. Nolan, William, John Huston, King Rebel , New York, 1965. Benayoun, Robert, John Huston , Paris, 1966; as John Huston: La Grande Ombre de l'aventure , Paris, 1985. Cecchini, Riccardo, John Huston , 1969. Parish, James Robert, and Michael Pitts, The Great Western Pictures , Metuchen, New Jersey, 1971. Tozzi, Romano, John Huston, A Picture Treasury of His Films , New York, 1971. Pratley, Gerald, The Cinema of John Huston , New York, 1977. Kaminsky, Stuart M., John Huston: Maker of Magic , London, 1978. Madsen, Axel, John Huston , New York, 1978. Huston, John, An Open Book , New York, 1980. Miller, Gabriel, Screening the Novel: Rediscovered American Fiction in Film , New York, 1980. Hammen, Scott, John Huston , Boston, 1985. McCarty, John, The Films of John Huston , Secaucus, New Jer-sey, 1987. Studlar, Gaylyn, editor, and David Desser, Reflections in a Male Eye: John Huston & the American Experience , Washington, D.C., 1993.
Cooper, Stephen, editor, Perspectives on John Huston , New York, 1994. Brill, Lesley, John Huston's Filmmaking , New York, 1997. Cohen, Allen, John Huston: A Guide to References and Resources , London, 1997. Myers, Jeffrey C., Bogart: A Life in Hollywood , Boston, 1997. Cunningham, Ernest W., Ultimate Bogie , Los Angeles, 1999. Duchovnay, Gerald, Humphrey Bogart: A Bio-Bibilography , Westport, 1999. Allen, L., "On the Set with John Huston," in Cinema (Los Angeles), July 1947. Variety (New York), 7 January 1948. New York Times , 24 January 1948. Time (New York), 2 February 1948. Morton, Lawrence, in Hollywood Quarterly , Spring 1948. Fowler, Dan, "Walter Huston's Bad Boy John," in Look (New York), 10 May 1949. Desternes, Jean, in Revue du Cinéma (Paris), no. 8, 1950. Subiela, Michel, in Positif (Paris), no. 3, 1950. Pilati, Robert, in Ecran Français (Paris), 15 February 1950. McCarty, Clifford, "Humphrey Bogart," in Films in Review (New York), May 1957. Archer, Eugene, in Film Culture (New York), no. 19, 1959. "John Huston," in Films and Filming (London), September and October 1959. Vermilye, Jerry, in Films in Review (New York), February 1960. Majdalany, Fred, "Viewing Report: Treasure on Sierra Madre ," in Screen Education (London), March-April 1965. Bachman, Gideon, "How I Make Films: An Interview with John Huston," in Film Quarterly (Berkeley), Fall 1965. Jones, Dupre, "Beating the Devil: 30 Years of John Huston," in Films and Filming (London), January 1973. Graham, Olive, in Cinema Texas Program Notes (Austin), 3 May 1979. "John Huston," and "Walter Huston," in Film Dope (London), January 1983. Buckley, M., "John Huston," in Films in Review (New York), April 1985. Combs, Richard, "The Man Who Would be Ahab: The Myths and Masks of John Huston," in Monthly Film Bulletin (London), December 1985. Schickel, Richard, "Bogart," in Film Comment (New York), May-June 1986. Engell, J., " The Treasure of the Sierra Madre: B. Traven, John Huston and Ideology in Film Adaptation," in Literature/Film Quarterly (Salisbury, Maryland), vol. 17, no. 4, October 1989. Reid's Film Index (Wyong), no. 5, 1990. Souder, William, "High Adventure: The Art of Making a Film Epic," in Minneapolis-St. Paul Magazine , vol. 25, no. 2, Febru-ary 1997. The Treasure of the Sierra Madre has become the archetypal John Huston film. One reason is that it is a clear examination of the exploration or the quest. As in many of his films to come (and The Maltese Falcon , to some extent, before it), Huston here examines a small group of people on a quest for wealth. Generally, in his films with this theme the members of the group accomplish their initial goal: they obtain the money or the treasure. Once having attained it, however, they often find the potential power it brings too much to handle. Human greed, weakness, or obsession destroy their victory. This is remarkably true of Treasure, The Asphalt Jungle, Beat the Devil, The Kremlin Letter , and The Man Who Would Be King . In all these films, however, Huston does not simply examine greed and present a moral statement about it. He examines the disintegration or change within the individual who has to learn to cope with the specter of wealth of power and the erosion of the fragile group or couple when chance, greed, envy, or obsession intrude on their existence. Treasure is not a moral statement by Huston but an examination of characters under pressure, who fall apart when least expected to and rise to noble reactions when no reason is given to believe they will. 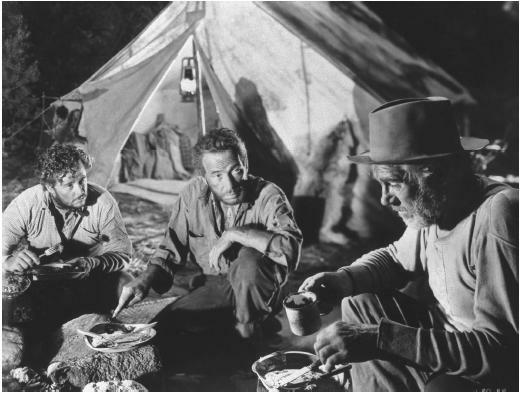 In order to make The Treasure of the Sierra Madre , Huston convinced Warner Brothers to let him shoot on location for ten weeks in Mexico. In documentaries in the army, he had grown accustomed to location work and now felt comfortable with it. "Locationing? Nothing to it," he said. "The only time it's tough to make pictures on location is when someone is shooting at you." In his search for the concrete in making the film, Huston went to the extreme of shooting exteriors in San Jose de Purua, an isolated village 140 miles north of Mexico city. Humphrey Bogart, who played Dobbs, recalled: "John wanted everything perfect. If he saw a nearby mountain that would serve for photographic purposes, that mountain was not good; too easy to reach. If we could go to a location site without fording a couple of streams and walking through snake-infested areas in the scorching sun, then it wasn't quite right." Huston's other stars included his father, Walter Huston, as Howard, and cowboy actor Tim Holt as Curtin. Dobbs is frequently described as a moral brute and a madman, but clearly he is a highly contradictory character until his crack-up. He is initially generous and willing to share his cash, and he rather nobly throws away the gold that Curtin offers him to pay back the extra money he has put to finance the trip. Later, it is Dobbs who agrees to help Howard rebuild the "wounded" mountain. Howard, the doctor/father, constantly warns that gold is a potential disease. He is aware of the danger and protects himself, and Curtin also learns to do so, but even Curtin has a moment of hesitation when he almost leaves Dobbs in the mine after a collapse. It is Dobbs who succumbs to the disease, but he is not viewed as evil by Huston or, for that matter, by Howard. Time called the film "one of the best things Hollywood has done since it learned to talk . Walter Huston's performance is his best job in a lifetime of acting." Bosley Crowther in the New York Times wrote that "Huston has shaped a searching drama of the collision of civilization's vicious greeds with the instinct for self-preservation in an environment where all the barriers are down." James Agee and Newsweek also praised the film, but there was some antagonism. John McCarten in The New Yorker said the film could be reduced to the idea that greed does not pay. He went on to say that "even if the premise is granted, the film's methods of elaborating on it are certainly something less than beguiling." While the mixed reviews filtered in, Huston plunged into his next project, but his work was disrupted when the Academy Awards for 1948 were announced. For the first time, a father-and-son team won the awards, John as best director, Walter as best supporting actor.